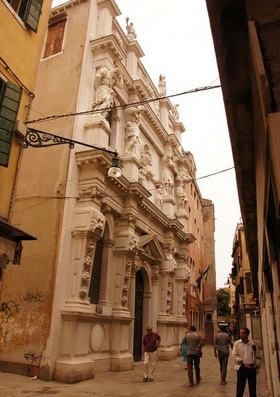 Baldassare Longhena was having a bad day when he designed this nervous wreck of a Baroque façade near SS. Giovanni e Paolo; the cumulative effect of all the strong men, lions and giant telamones hovers somewhere between a circus poster and low- calorie nightmare – a fair reflection of the low ebb of everyday life in the declining 1670s. 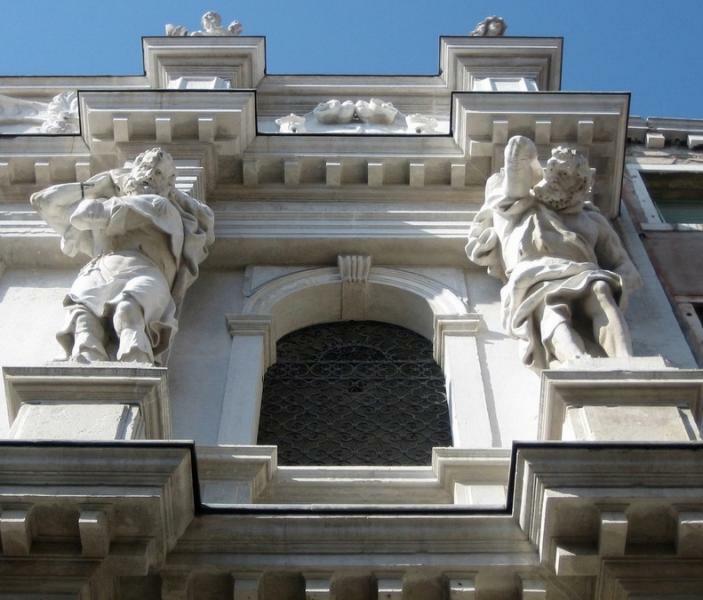 Ruskin found it 'the most monstrous' façade in Venice. There's a bust of the man who paid for its completion, merchant Bartolomeo Cagnoni, front and centre, but like several other churches in Venice, a decided lack of Christian imagery. Also known as Santa Maria dei Derelitti (‘of the waifs’), it belonged to a hospital and school for orphans (or the illegitimate daughters of the nobility) founded in 1527. As at La Pietà, its female students became internationally famous for their music (its elegant concert chamber, frescoed in the 18th century by Jacopo Guarana, with architectural frescoes by Antonio Mengozzi Colonna may be seen on request for €2). Longhena also redesigned the interior of the church (entered by a side door of the hospital, which is today an old people's home). This is decorated with some fairly vertiginous ceiling frescoes by Giuseppe Cherubini (1907), and include a trompe l’œil organ zooming out over the altar. There is a sampling of 17th and 18th-century Venetian paintings, including the Evangelists by Pietro Liberi and a dramatic early Giambattista Tiepolo, Abraham’s Sacrifice of Isaac, a small vignette over the fourth arch on the right. All the little scenes in the spandrels are good, although hard to see; some on the right side are Tiepolo's earliest known works.